The four faces are Breath, Fire & Water, Vapor, and Liquid Metal. Each of these faces can support up to three complications -- top left (small), top right (small), and the bottom (wide). All of the new faces can be viewed on the Apple Watch or from within the iOS Watch app. They all have different options available such as different colors or elements. Breath has three different views such as classic, calm, and focus. Fire & Water can display fire, water, or alternate between the two. Vapor and Liquid Metal both have several color options to stick two, or two rotate between each time the watch awakes. Apple's upcoming Series 4 Apple Watch has additional watch faces including Infograph and the updated Infograph Modular. Find out how to save up to $70 on pre-orders here. 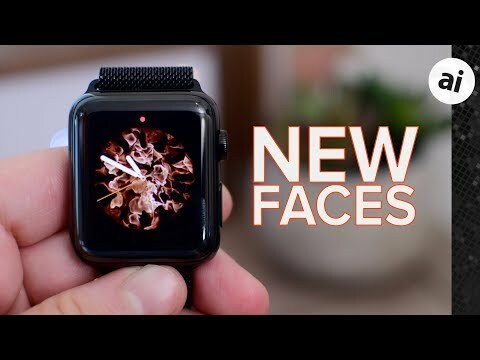 Be sure to check out everything else new in watchOS 5! This is so apple, those animations are not using the full screen as they do on AW4 so your "old" watch will look so small and you better update to new, bigger one. They really don't look nice in this tinny circle. I was really hoping for the one with all those complications but again need to update to AW4 for that as well. So much for keeping older devices current and used as long as possibile. Another advice, don't buy the Nike version if your intention is to use Nike app for running. This app is so messed up for over a year now, no gps tracking, no map tracking, crashes all the time, deletes runs, half the time it won't sync with iphone. This is so apple, those animations are not using the full screen as they do on AW4 so your "old" watch will look so small and you better update to new, bigger one. They really don't look nice in this tinny circle. I was really hoping for the one with all those complications but again need to update to AW4 for that as well. So much for keeping older devices current and used as long as possibile. That's a real stretch. The new faces are no smaller or less attractive than any of the other round-with-corner-complications faces available previously. All of them look beautiful. Apple Watches get new looks while Rolexs stay the same till you die. Even after your death ,still the same. Apple Watches can have their batteries replaced, so they can last a few decades too. "stick two, or two rotate between"? I tried these out briefly the other day. IMO they look like crap on my Series 3 confined to the circle. They will look much better once my Series 4 is in hand, but I still won't use them as I generally us the Siri face, or Modular. Nothing beats the Hermes watch faces. I still love series 3 Hermes faces. Does anyone know what material the watch glass is, and does the stainless model still come with sapphire crystal? I've looked around, but cant find any information on it.